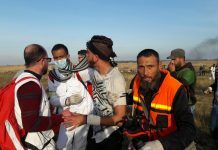 Palestinian civilians, including a child, were seriously injured. continued and more areas of Palestinian land were confiscated for this purpose. · IOF conducted a series of incursions into Palestinian areas. civilians and property in the West Bank. Palestinian land for this purpose. innocent civilians and their property. follow the IOF’s decision to construct the wall. Palestinian land for settlement activities. tightened siege on the OPT, including Jerusalem. near Israeli settlements, causing more suffering to Palestinian civilians. also beat a number of civilians and imposed restrictions on journalists. full report is available PDF format.